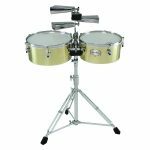 Ideal for students and recreational players, or the perfect set of grab'n'go Timbales, Fiesta Timbales are available as a 14" and 15" set with lightweight dual stand. 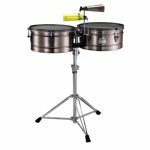 Constructed from black powder-coated steel, these entry-level Timbales are a top-tuning model with drumset style lugs and top ring. 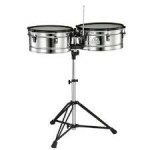 Incorporating many of the same features as our top line instruments, Fiesta Timbales offer tone and durability typically found at a much higher price point. Pearl Steel Timbales model PTE-1415DX are for the player who is looking for a good sounding basic timbale set with 14"&15" steel shells. Tilting stand and cowbell post included. 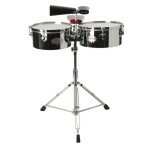 The Pearl-Marc Quinones Steel Timbales w/ Stand model ETE-1415MQ feature high quality polished steel shells. They have top tuning lugs which give more playing surface on the shell. Designed by Marc Quinones, these timbales have become the industry standard and are the drums to own for the discriminating pro. These 14"&15" drums sing! 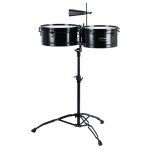 Clave block, cowbell post and top of the line Pearl tilting stand included.